Jain Irrigation Founder Chairman Hon. Bhavarlalji Jain’s photos and inspiring quotes were used on the dais while the report concept ‘Goodness All The Way’ formed the backdrop of dais of JISL’s 31st AGM. Company is progressing very well with all round progress as compared to the last year. Jain Irrigation Systems Ltd. (JISL) has been winning many large national and international projects. Scientists of JISL are working very hard to enable sustainable development of farmers. Therefore it can be observed that the lifestyle of farmers has improved a great deal. So this year Jain Irrigation has declared one rupee per share dividend to the shareholders. JISL has achieved 17 % rise in the annual turnover this financial year. Mr Anil Jain, the Vice-Chairman and Managing Director, JISL, stated today. The 31st Annual General Meeting of JISL was held here under the Chairmanship of Mr Ashok Jain, Vice-Chairman Anil Jain, Joint Managing Director Ajit Jain, Atul Jain, Director , Mr Vasant Warti, Ghanshyam Dass, Dr. H P Singh, Ramesh Rathi, Mr.Sanghpati Dalichand Jain, Mr.Girdharilal Oswal, Jain Farm Fresh Foods Ltd. Director Athang Jain, Executive Director Sunil Deshpande and Company Secretary A V Ghodgaonkar were present on the dais on the occasion. Stakeholders, daughter-in-laws of Jain family and students of Anubhuti School and Raisoni College were also present. At the beginning, meeting began by paying tributes to those who expired during the last year. Haliyal in Karnataka has become the first city in India to provide 24X7 drinking water supply. Jain Irrigation’s technology has been used to execute this scheme. One Control Room monitors the supply of water to the whole city. Clean, pure and quality water is made available through this scheme. This city used to need 52 lakh litres of water per day before the completion of this scheme. Now this city needs only 27 lakh litres per day. One can easily notice that nearly 50% water has been saved. Jain Irrigation’s reputation as a water utility company is on the rise. Mr Anil Jain, Vice-Chairman, JISL, also presented report card of the Company. Compared to the turnover in 2016-17, JISL has registered 17% increase in the total turnover in the financial year 2017-18. In 1988, Jain Irrigation was a small listed company but now it has become a global one. He discussed several businesses of the company including plastic sheets, pipes, food processing, several projects in India and overseas and the work done at several levels. The Mohanpura project in Madhya Pradesh (MP) has already become largest Integrated Micro Irrigation scheme benefitting more than 9000 farmers. He also informed all about the Rwanda and Honduras projects. Moreover, the Company has been carrying forward with full vigour the legacy of Hon. Padmshri Bhavarlalji Jain. All associates including scientists have been playing a very important role in this effort. Two years ago, JISL (Jain Irrigation) had declared 50 paisa dividend per share. Last year, JISL declared 75 paisa per share equity dividend and now this year, shareholders should be glad to know that JISL has already declared one rupee per share dividend. Solar energy would be very important in the future and therefore, with that medium farmers will be able to harvest two crops in a year. They can get third crop of solar energy to earn more money. Jain Irrigation Chairman Ashok Jain also interacted with all. 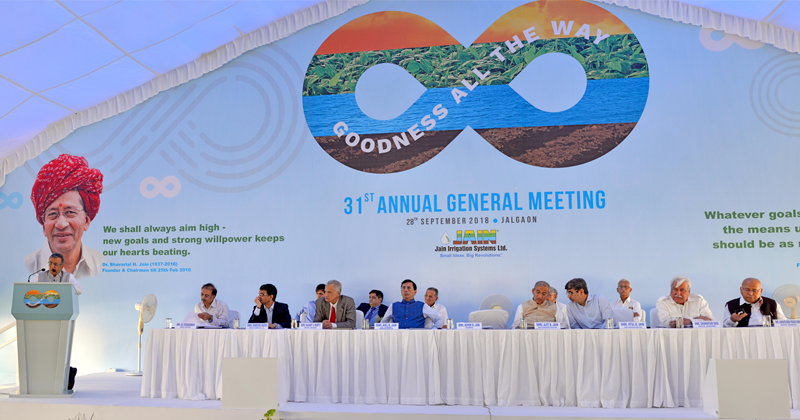 He clarified on the concept behind the report of the 31st Annual General Meeting (AGM) – ‘Goodness All The Way.’ It means all are pious and good eternally. Everyday all people should be happy and prosperous. Mr Ashok Jain elaborated on the welfare perspective of Jain Irrigation. Jain Irrigation Founder Chairman Hon. Padmashri Bhavarlalji Jain had followed a thought process about the development and progress of farmers. The generation next of Jain family would also carry forward the same thought process. 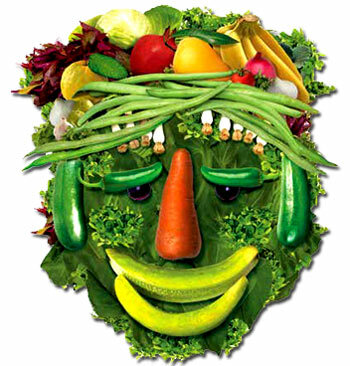 The Company is committed to ensure water, food and energy security by undertaking high technology agriculture. It results in more crop output and more income for farmers. Naturally it will lead to make the black soil fully green and sustainable. Atul Jain, Joint Managing Director, JISL, proposed a vote of thanks. The programme concluded with the singing of national anthem by all.